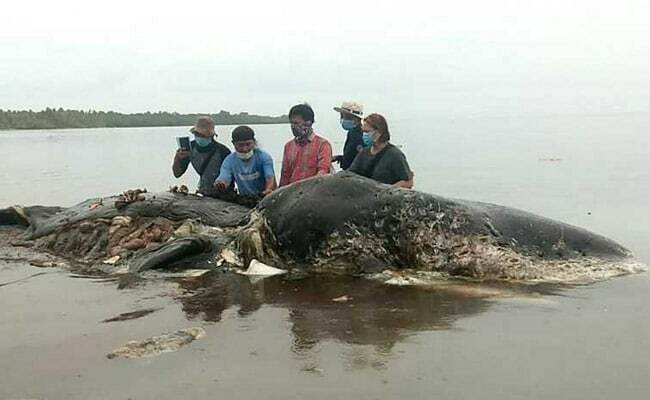 Conservation group WWF Indonesia said it found four plastic bottles and 3.26 kg of raffia rope, as well as the plastic bags and cups, in the stomach of the dead whale. A sperm whale has been found dead in Indonesia with 115 plastic cups and 25 plastic bags in its stomach, raising concern among environmentalists and throwing the spotlight on the country's rubbish problem. The exact cause of the whale's death is not yet known but there are signs that "plastic waste might have triggered it", WWF Indonesia marine species conservation coordinator Dwi Suprapti told AFP. Wakatobi district, a picturesque collection of four main islands surrounded by a marine reserve, has urged Indonesia's central government to help tackle the problem of marine debris. Indonesia is the world's second biggest contributor to marine debris after China, and a colossal 1.29 million metric tons is estimated to be produced annually. The problem has grown so bad that Indonesian officials declared a "garbage emergency" last year after a six-kilometre stretch of coast along the island of Bali was swamped with rubbish.